Press Eye - Belfast - Northern Ireland - 4th July 2018 Dubai Duty Free Irish Open hosted by the Rory Foundation at Ballyliffin Golf Club, Co Donegal, Ireland. Rory McIlroy practices before the Pro-Am at Ballyliffin. Photo by Kelvin Boyes / Press Eye. 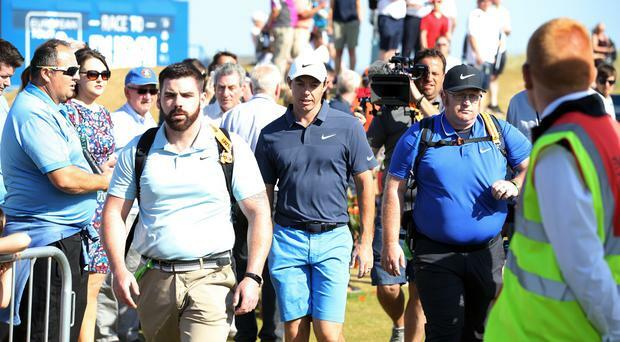 Rory McIlroy can’t wait to take on a really tough test at ‘beautiful’ Ballyliffin this week at the Dubai Duty Free Irish Open. The World No.8 was vocal in his praise for the course and its surrounding area, which earns rave reviews for its picturesque scenery and stunning views. McIlroy hasn’t played here since 2006, when he took on hero Nick Faldo in an exhibition match on the Old Links, which the then 17-year old won against the six-time Major winner to announce himself. This week it’ll be the Glashedy Links that McIlroy will tackle, although the Old Links is considered to be a fine course as well, and the Holywood golfer admits he’s been blown away by the beauty of northern Donegal. “(It’s) fantastic,” McIlroy praised. “I haven’t played here in 12 years, I’d forgotten how good it was and how beautiful the area is. “It’s a great golf course. Pat Ruddy designed it, and he designed The European Club down in Wicklow as well, and I’m a big fan of it. “It’s a tough track. You can’t put it in the bunkers off the tee, they’re really penal. You have to hit fairways, the greens are getting firm, it’s getting bouncy out there - it’s going to be a really good test this week. After opting to skip last week’s Open de France in order to take a bit of a rest, McIlroy reveals he’s champing at the bit to get back on the course and competing again. No doubt he will relish the challenge of taking the crown off defending champion Jon Rahm, and the Northern Irishman says he’s not good at missing out on tournaments. “I had a week off last week and I was looking forward to getting back here and getting back into tournament play,” he admitted. “That is fun for me. I’m away from it for a week and I miss it and I want to get back to it. "There's been a couple of times where I just haven't felt as prepared as I could have been walking on to the first tee on Thursday. So got here Monday morning, practiced all day Monday afternoon. Was here yesterday at 8.00. "I've done my work. So there's no excuse about not being prepared or not, and I've learned that as I went along. I felt I was underprepared at County Down. I felt okay at The K Club I guess. I've learnt as I went along and I feel this year, I'm right where I need to be.